It's hard to store and organize spools of ribbon and rolls of colorful washi tape that so many crafters use for a variety of neat projects. 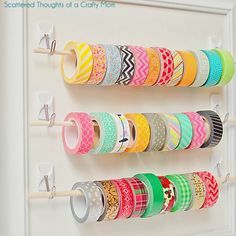 Paint a wood bracelet holder in a vibrant color, and store your spools of ribbon and tape on the dowels of it for a pretty yet functional storage option. Transform a wall-mount shower caddy into a craft storage center. You can store instructional books, sewing patterns, cards and envelopes on the shelves, and hang scissors, ribbon and other tools down below. For those who use embroidery floss for crafting, know how easily it can become a tangled mess resembling a bird's nest. Wrap each strand of embroidery floss around a clothespin, and put the end of it securely under the bottom part of the clothespin that automatically snaps closed. You can often find printer trays at flea markets and thrift stores. Printer trays are ideal for organizing craft supplies including ribbon, scrap booking supplies and beads. You can place your trays across your crafting table or on shelves next to your working area for easy access. Brighten up your work space with a couple of pieces of pegboard painted in bold colors that can also be used as storage. Hang them side by side on one of the walls in your crafting area. You can hang small storage racks, scissors and a variety of craft supplies from hooks placed in the holes of the pegboard pieces. Paint a standing shoe cubby in a vibrant color that coordinates with your crafting area. In some of the compartments, you can also place decorative baskets and boxes. You can store a sewing machine or other crafting devices on top of your standing shoe unit. You can store everything from scrapbook paper to fabric and a glue gun to other crafting necessities in the baskets and compartments of the standing shoe organizer. Teacups make unique and pretty little storage solutions for jewelry makers or any crafter who uses small parts to make their creations. Tape your vintage teacups to the bottom of a shelf or drawer to keep them from tipping over or sliding around. These helpful and creative organizing tips will help you keep your crafting area organized, pretty and supplies easily accessible for the utmost productivity. This guest post contribution is courtesy of The Ribbon Retreat, a crafting site dedicated to all things ribbon and more such as elastic ribbon, sequin ribbon and chevron ribbon.